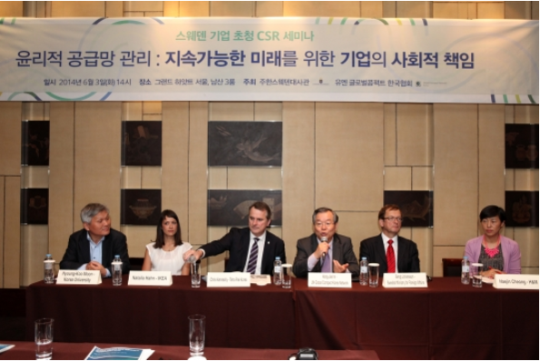 On June 3, Q&A session at a seminar titled 'Ethical management of supply chains: CSR for sustainable future' held at Grand Hyatt Hotel, Seoul. Last spring, H&M, the world's second largest fast fashion chain, launched a clothing collecting initiative worldwide under which the company turns the old clothes and textiles into new products and incentivizes consumers to take part in the program by giving them a discount on one item of their choice. Last year alone, H&M collected 3047 tons of used garments worth 15 million new T-shirts. On June 3, H&M introduced its sustainable management policies at a seminar titled 'Ethical management of supply chains: CSR for sustainable future' held at Grand Hyatt Hotel, Seoul, highlighting that no fashion should go to waste. The top Swedish companies like H&M and IKEA shared their Corporate Social Responsibility (CSR) activities and their vision for sustainability at the seminar co-hosted by the UN Global Compact Network Korea and the Embassy of Sweden in Korea. Tetra Pak, a multinational company of Swedish origin well-known for its food and beverage packaging and processing, particularly for its aseptic packaging technology, unveiled its aims for 100% sustainable packaging by 2020. The president of Tetra Korea Chris Kenneally said "To offer quality environmental education characterized by 4Rs (Renew, Reduce, Recycle, and Responsibility), we are committed to working with our customers, suppliers, governments, NGOs, and local communities." He added "Achieving gender equality is part of our CSR activities. To help working moms juggle between work and family, since last year, we have provided mentoring support to the Soroptimist, a worldwide volunteer service organization for business and professional women who work to improve the lives of other women and girls in local communities." IKEA's Sustainability Manager Natalia Hahn is answering a question. For an efficient use of energy and sustainable growth, IKEA, the world's leading home furnishings retailer, plans to sell only LED lights by 2016 and install rooftop solar panels for its stores. 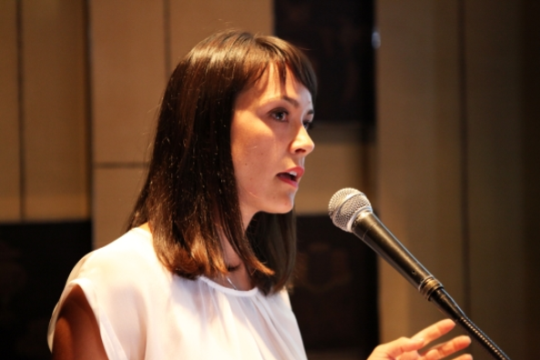 IKEA's Sustainability Manager Natalia Hahn said "In consistent with our sustainable management strategy that executives should take a leading role in pursuing gender equality, 47% of leadership positions in IKEA are held by women. IKEA is a flexible company in that it acknowledges the importance of reaching an ideal work-life balance for women." In 2007, Sweden became the first country in the world to require its companies to report on their sustainability activities. The Swedish Foreign Office has the CSR Ambassador, a special post working with CSR. According to the CSR Ambassador Bengt Johansson, CSR covers a wide range of activities from carbon emissions reduction, gender diversity, participation in local communities, and anti-corruption. Among others, gender equality is an important aspect of CSR. "By making it possible for parents to combine work and family, companies can promote equality. Ensuring equal participation in society is a prerequisite for equal representation. Companies, therefore, should strive to guarantee the right to equal pay and labor conditions," said Johansson.